Xbox 360 Slim 4G is the successor of the previous generation Xbox360 Arcade system. The console is equipped with 4G memory card, HDMI Full HD 1080p output, wireless X360 controller, Xbox Live support, Kinect ready capabilities. 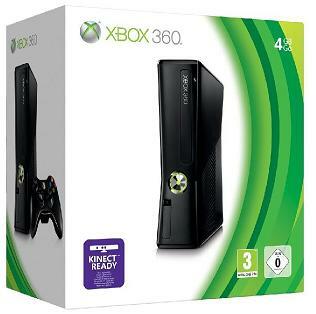 The Xbox 360 gaming console comes with HD movies, blockbuster games, and wireless fun for all! The exclusive Xbox 360 4 Gb gaming system is leaner, sleeker, and better than ever! Stream TV shows and HD movies thanks to integrated Wi-Fi antenna and get the most out of controller-free gaming with the new Kinect. Integrated Wi-Fi: The exclusive Xbox 360 is the only gaming system in the world with integrated 802.11n Wi-Fi, allowing for easier and faster connection to Xbox LIVE. Download games and steam TV shows and HD movies from anywhere within your house. Xbox LIVE: Stream crystal-clear HD TV shows and movies from Sky, plus download add-ons for your games including songs, maps, characters, and new levels. Jump into online multi-player competitions and play with friends from all over the world. And, you can also use Twitter, Facebook, and listen to Last.fm. Ready for Kinect: The Xbox 360 4 gigabyte gaming system as a special port to connect the Kinect sensor. Take gaming to a whole new level with Kinect; no controller is required. Play games and have fun by simply using your motion. Kinect even allows you to control a movie by simply waving your hand. Black wireless Controller: This high wireless high-performance controller has a range of 30 feet and 30 hours of battery life, running on 2 AA batteries. Additional ports: More USB ports allow you to connect more storage devices and other accessories. The new Xbox 360 4 gigabyte gaming system has 5 USB ports, giving you plenty of places to connect your stuff to. Besides the standard HDMI and Ethernet ports, the 360 4GB also has an optical audio out port for connecting to your A/V receiver. Connect the console to a broadband connection. Open the dashboard and select “My Xbox”. Then, sign on and create a profile. Follow the rest of the instructions to create the account. Next, select the newly-created profile and click “join Xbox LIVE”. Follow the instructions, redeem the code and have fun! Select the redeem code option and get back to the fun!